Open Source Products: their products and resources carry no patents, so anyone can use, modify and even sell them. Being open source encourages people to share and learn from each other. It also forces them to focus on what they do best and constantly innovate. In short, it makes everyone better. Community Outreach: Through their Community Partnership Program, they’ve donated supplies, parts and expertise to over 140 projects, universities and programs in six countries in the first half of 2017 alone, with awards issued every month. Education Support: Sparkfun believes everyone deserves access to electronics literacy. In their Department of Education, they believe electronics are more than a hobby or career path; they’re a creative medium for teaching and learning. Since 2009, Sparkfun has helped students and educators around the world introduce these tools and concepts into their schools. Processing is a free, beginner-friendly programming language designed to help non-programmers create interactive art with code. In Processing, you can make a masterpiece with just a simple program, and at the click of a button, the software displays your handiwork on-screen for instant feedback. The SparkFun Guide to Processing teaches you to craft your own digital artwork and even combine it with hardware—no prior programming experience required. Over the course of the book, you’ll learn the basics by drawing simple shapes, move on to photo editing and video manipulation, and ultimately affect the physical world by using Processing with an Arduino. Art and programming aren’t mutually exclusive, and with Processing as your digital paint brush, you’ll code your own gallery in no time. The author, Derek is Sparkfun’s Department of Education’s Educational Technologist, responsible for creating outstanding curriculum and materials for electronics education. Before joining us at SparkFun, Derek taught middle school technology courses that were centered on Processing and Arduino. The Arduino microcontroller makes it easy to learn about electronics, but it can be hard to know where to start. The 10 projects in The SparkFun Arduino Inventor’s Guide will teach you to build, code and invent with the super-smart Arduino and a handful of parts. 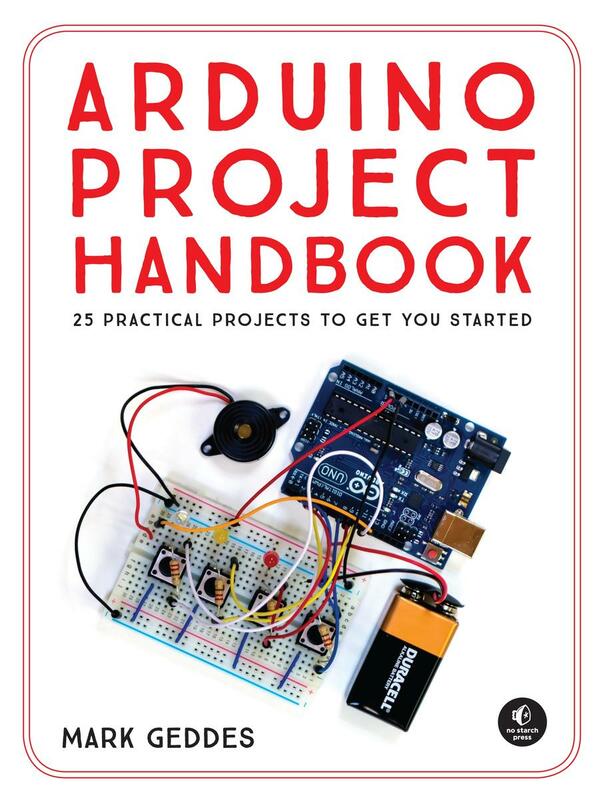 Another Arduino project book to check out: Arduino Project Handbook by Mark Geddes, a beginner-friendly collection of electronics projects using the low-cost Arduino board. With just a handful of components, an ­Arduino, and a computer, you’ll learn to build and program everything from light shows to arcade games to an ultrasonic security system. First you’ll get set up with an introduction to the Arduino and valuable advice on tools and components. Then you can work through the book in order or just jump to projects that catch your eye. Each project includes simple instructions, colorful photos and ­circuit diagrams, and all necessary code. Arduino Project Handbook is a fast and fun way to get started with micro­controllers that’s perfect for beginners, hobbyists, parents, and educators.